Do you want to start making money fast? Having trouble creating and marketing your own products? 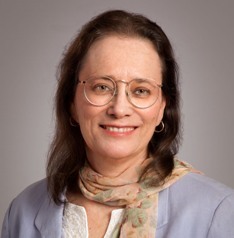 I’m Ellen Finkelstein, owner of Change the World Marketing, and I’ve been making thousands of dollars a year as an affiliate for several partners that I trust. Although I have my own products, having this extra income has been SO welcome! I’ve learned the ins and outs of affiliate marketing from both sides — I have affiliates who sell my products, too — and want to share this knowledge with you. 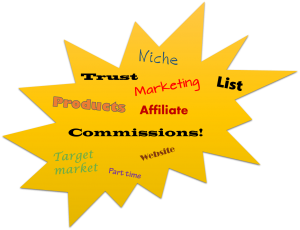 Because you should know how to use affiliate marketing to make money! Fast results With my 30-day plan, you can be up and running — making money within 30 days! Passive income If you choose your products and affiliate partners well, you can make passive income, even recurring passive income for a long time to come! Sets you up for future success As you develop your affiliate business, you’ll also create the foundation for selling your own products, when you create them. For example, if you’ve promoted someone else’s products, that person is much more likely to promote yours. 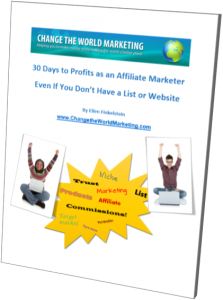 I guarantee that you’ll find the information in “30 Days to Profits as an Affiliate Marketer Even If You Don’t Have a List or Website” valuable and useful, giving you the steps you need to start making money as an affiliate. If you don’t agree, let me know within 30 days and I’ll refund your purchase price. Yup, that means you can finish the program and then decide. 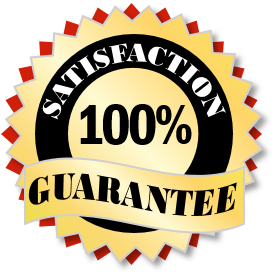 Note: Actual results will depend, of course, on your actions, so I can’t guarantee that you will make money. That’s up to you! 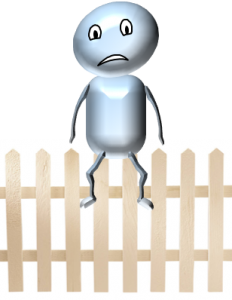 Have you been sitting on the fence? Have you been thinking about affiliate marketing but not doing anything? Have you been taking courses and not applying them? The unique value of this short report is that is has actionable steps for you to take throughout 30 days. You can put it to use immediately. It’s for today, not for tomorrow! Procrastination doesn’t get you results. Action does! My motto is Learn-Act-Succeed. So act now, buy this short report and start applying the steps now! P.S. Reminder! If you want to make money, you need to take action! Affiliate marketing is one of the quickest ways to get up and running, even if you don’t have a website or list.